Free Shipping Included! 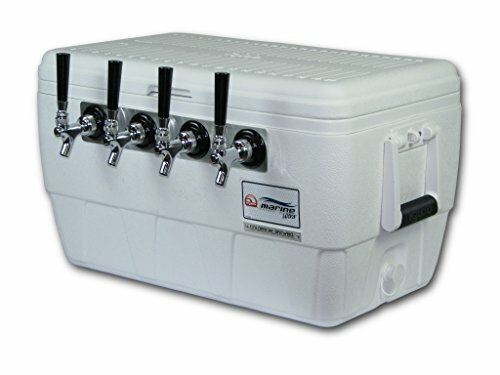 Coldbreak Brewing Equipment CBJB48QT4T Jockey Box, 4 Tap, Marine Pass Through, 48 quart Cooler, 50' Coils, 0.25'' ID, 0.3125'' OD, Stainless Steel, White by Coldbreak Brewing Equipment at In The National Interest. MPN: CBJB48QT4T. Hurry! Limited time offer. Offer valid only while supplies last. Cold break jockey boxes are built specifically for the craft beer industry and designed so your beer has 100 percent contact with stainless steel. Cold break jockey boxes are built specifically for the craft beer industry and designed so your beer has 100 percent contact with stainless steel. All shanks, coils, ferrules, and faucets are all made from stainless steel. Beverage line inputs are located on the back of the jockey box, allowing a clean look on the pour side. Perfect for any environment where individuals are self pouring (weddings, parties, banquets, etc.) or when Breweries need a lot of taps in a small space. If you have any questions about this product by Coldbreak Brewing Equipment, contact us by completing and submitting the form below. If you are looking for a specif part number, please include it with your message. HFS (R) 6x48" Flow Sanitary HIGH GRADE Stainless STEEL 304 PIPE, LENGTH 48"
GF Signet 3-2537-6C-P0 Integral Mount Paddlewheel Flow Sensor, Polypropylene Body, Black PVDF Rotor, Titanium Pin, 4 mA-20 mA Output, 0.5" to 4", 11"